Installing a vapor barrier is one of the basic steps in dealing with crawl space moisture. The vapor barrier keeps moisture out of the crawl space. It is therefore important to ensure that it is installed correctly. You will otherwise continue having moisture problems in your crawl space. The following are common mistakes made by those inexperienced in installing vapor barriers. There are those who think that by installing the vapor barrier under the gravel they can effectively stop the ground moisture from entering the crawl space. They therefore lay the vapor barrier on the ground and then cover it with about 6” of gravel. The problem with this is that water will tend to pool on top of the vapor barrier during the rainy season. You’ll essentially have created a pool in your crawl space. The gravel only makes the situation worse by holding the water in the crawl space for a prolonged time. There are still others who believe that they can protect their floors by attaching the vapor barrier to the ceiling of the crawl space. This has the opposite effect. The wood of the floor rots and the mold will grow in the space. This occurs as a result of condensate from pipes, duct work and the floor itself. Moisture is trapped between the floor and the vapor barrier and causes rot as well as the growth of mold. This is another common mistake made by both ‘DIYers’ and inexperienced contractors. In a bid to achieve encapsulation, some people run the vapor barriers up the walls of the foundation and then staple the barrier to the sill plate. The result is that the vapor barrier’s seams are not taped and therefore not properly sealed for moisture from the ground. Moisture then wicks up and is absorbed by the foundation wall and floor joists. It is important to ensure that you choose an experienced and licensed contractor when dealing with crawl space moisture. This ensures that you are provided with a solution that actually works for the long term. 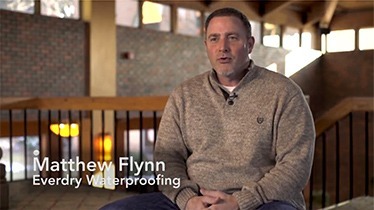 Be sure to ask your contractor questions about their solutions for your crawl space. Understanding what is available in the market will help you in making an informed choice.